MN Summary: more information is needed than is exposed currently as steps in blue ocean (and possibly classic, but that isn't clear just yet) - more investigation needed. An unpleasant fallback is to resort to viewing full log, but that isn't obvious or nice. 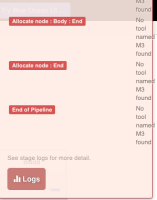 It appears that the console output doesn't include the "node allocation" information which is useful when trying to debug systemic issues in Jenkins agents. Based on primitive experiments, it looks like it may include more. Michael Neale added a comment - 2016-10-06 08:17 - edited [~201604291_tyler] it would be good if you could also look at the classic stage view - to see if it includes it there (I think it includes some detail) Based on primitive experiments, it looks like it may include more. Vivek Pandey I thought this may be of interest while you are digging into bismuth. It would be wonderful if we could surface this extra information as steps. If this isn't possible, perhaps we should close this and either rethink the design to show the full log in some cases, or ... don't know what else. Michael Neale added a comment - 2016-10-06 08:34 Vivek Pandey I thought this may be of interest while you are digging into bismuth. It would be wonderful if we could surface this extra information as steps. If this isn't possible, perhaps we should close this and either rethink the design to show the full log in some cases, or ... don't know what else. Michael Neale Vivek Pandey I like the step idea if thats possible. Perhaps Sam Van Oort has some ideas. James Dumay added a comment - 2016-10-24 04:04 - edited Michael Neale Vivek Pandey I like the step idea if thats possible. Perhaps Sam Van Oort has some ideas. Michael Neale aside from node info - what else is there thats important? James Dumay added a comment - 2016-10-24 07:28 Michael Neale aside from node info - what else is there thats important? We are discussing a more generic solution for this on JENKINS-40466. James Dumay added a comment - 2016-12-22 05:57 We are discussing a more generic solution for this on JENKINS-40466 .